Qantas chief executive Alan Joyce says a nonstop service between Perth and London would lead to the airline having an improved operation into the UK capital. Joyce was asked at the company’s annual general meeting in Sydney on Friday if the airline’s two London routes were profitable. In response, Joyce said the airline did not “give details on our route network”. “But I have to say, London is a challenge because you have over 30 carriers operating on that market and we have extremely low airfares,” Joyce said. “That’s one of the reasons we are considering an operation like Perth-London. 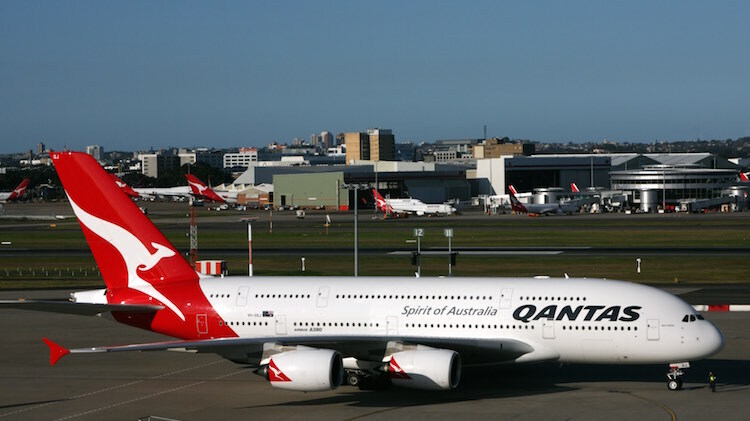 Qantas flies daily from Melbourne and Sydney to London via Dubai with Airbus A380s. It is the airline’s only online destination in Europe, with the rest of the continent served via codeshares on its alliance partner Emirates through Dubai. Qantas also had a codeshare in place with fellow oneworld member Finnair for Helsinki, which Emirates does not serve. Joyce said the company was currently evaluating new routes and destinations with the upcoming arrival of the Boeing 787-9 into the fleet, given the aircraft’s operating economics and long-range capability, as well as the still-in-development ultra long-haul Boeing 777-8X. “In the future aircraft like the 777-8X, which may allow us to fly from Sydney and Melbourne directly into Europe in both directions, could change the face of Qantas’s route network,” Joyce said. In the October edition of Australian Aviation, Joyce said the support of local airports, particularly with suitable infrastructure to handle the connecting traffic needed to feed such ultra long-haul routes, could not be underestimated. “The viability of the routes are very much dependent on some of the airport infrastructure issues,” Joyce told Australian Aviation in an interview. “That makes all the difference in the business case. “Take Perth as an example. If international was still on the other side of the field and all of our domestic flights that are creating the hub to connect are on the domestic side of the field, that doesn’t work. “If you are travelling from Adelaide to Perth to London or Adelaide to Singapore to London, the minimum connection times determine which routing you take and if Perth is not attractive it kills it. Meanwhile, Joyce said in response to separate question the company had not made any decisions on the proposed Badgerys Creek airport in Sydney’s west and was not “spending any capital” in relation to the airport. So it looks like PER – LHR non stop is not possible with the current arrangement of separate domestic and international terminals. Unless they can get permission to move there operations all under the one roof it won’t happen. These days there is no need to have separate, dedicated domestic and international terminals. With a tiny bit more infrastructure then every gate could be either. Flexible gates are becoming more common worldwide so they can be switched between domestic and international very quickly using movable partitions. Or even in the short term, put a couple of international gates within the existing domestic terminal like Gold Coast. The Forrestfield-Airport Link Railway connection between the existing domestic and international terminals will help but wont be finished until 2020. So how big would the market be for Perth to London? It would still be one stop from East Coast to London. And any performance engineer will tell you that the fuel burn on a single 20 hour flight is significantly greater than two 10 hour flights. Passengers would be paying a premium from the East Coast for essentially the same overall flight time and stopovers as is currently available. Good luck with that. You won’t get INTL and DOM combined at T3/4 at PER anytime soon. ABF are short staffed enough as it is! QF missed the boat and VA now has the market for PER with T1/2 operations. Ray, it’s not about East Coast traffic (which would be served by the existing 380 services), that a would be traffic from WA that is currently travelling on other carriers metal (even if under a QF codeshare). Given QF likes following Borghetti’s lead (e.g. SYD/PEK) with the impending PER/AUH A332, I wouldn’t be surprised to see a QF A333 or INTL configured A332 do PER/DXB/LHR. I’m guessing it would still be a DXB stop enroute rather than ultra-long haul. Lots of freight to go to/from DXB to/from PER. The majority of west bound, northern hemisphere flights fly over Port Headland, Broome, none stop to Europe is possible. Ideal place for a port of entry to service most of Australia without cluttering up existing capital cities, could even serve New Zealand and Indonesia. Why not go back to Australia- SIN – LHR. A much liked route where you can stop over in Singapore rather than Dubai. Not everyone wants to go to London bring back Sydney to Rome on a Qantas aircraft I’m sure it can be done in a non stop 20hr flight. No way to make part of T3 International for QF and T4 the domestic hub? Matty – The rail line wont be of any use for connections unfortunately – it looks to be designed in line with the airport master plan in that it is hoped QF are operating out of new terminal in the T1/T2 precinct by “early 2020’s”. They have not placed a station near T3/T4 as I guess it is hoped the area is obsolete by then. If QF are still in T3/T4 in 2020 when the trains start rolling, you are looking at a 1km walk from T3 heading West (ie the WRONG WAY!) up Brearley Ave past the Dunreath Drive roundabout to get to Belmont Station to then board train across to the Airport station which looks to be underneath the T1 short term carpark – manageable for some but not feasible for many. Australia-SIN-LONDON is sorely missed.Singapore has so much more to offer than Dubai.Have a A330-200 FOR Adelaide Passengers and have the second Perth flight which is an afternoon service timed in such a way it connects to either QF1 OR QF9.Nobody wants Dubai. Seriously, the vast majority of passengers are Aussies …..
Aussie airline, Aussie airport hub, Aussie jobs, Aussie pride!!! I agree a much better place to stage long hops is Broome or Port Hedland. Think of the way BA does LCY to JFK with fuel stop at SNN. Joyce’s confrontational management style showing again with his last few comments in the article. If he wants QF to run international flights out of T3/T4 then let them set it up and pay for it. (Notwithstanding staff shortages and the like that others have mentioned.) But really, it all defies logic. QF all but abandoned Perth internationally years ago – so don’t come back trying to throw your weight around. If the B878 flights start in SYD or MEL (and replace, at least partially, an existing via DXB flight) then won’t the planes already be fairly full, so PER is not much more than a tech stop and any local pax can join the flight at T1 as they do now. Given the novelty and some promotion QF could probably fill 3 or 4 B787s locally from PER to LHR a week anyway, so any problems regarding the connections from other interstate domestic flights are moot. If we are talking about QF internal WA connections then I’d like to see the numbers on that. Notwithstanding any gate congestion as 6 or so B737s, B717s, and F100s converge on T3/T4 to connect with the B787 I say that you’d be talking about no more 10-20 pax per B787 flight. and the time it would take to get them through “seamlessly” would not be much shorter than them grabbing their bags and getting the shuttle bus to T1 as they do now. And if I were in Sydney wanting to fly to LHR I would certainly prefer a near halfway stop at DXB than 1:4, or 1:5, journey break that going via PER would mean. And LHR? Typical QF, as has also been mentioned. Why do they think that PER pax prefer EK, QR, EY, SQ, and CX? They actually fly to places in the rest of the world that we want to go to. Perth – London non-stop – really just trying to hype up a 20th century dream in my view. I think there will be movement on Perth London as it suits Canberra and Adelaide people perfectly with a one stop (on QF metal) rather than a two stop, and of course non stop for Perth folk. A lot of people do take the bus between Domestic and International in Sydney. A full bus load every 10 minutes (but I see AJs point). AJ is pressuring Perth airport to put some flexible gates (a la Canberrra or Adelaide) at Perth international. Then the London flight will happen. The other option I see being considered is that for the next EK agreement from 2018 is to move an A380 through Singapore and then hub with the other A333 flights from the other state capitals. This would beg the question whether one flight through Dubai is economic but the hub to continental Europe may be worth it, even if it means a bus on a 50C day to the nether regions of Dubai airport. It still beats the bus at Heathrow. I’m also firmly in the Aus – Singapore – London camp!! The reason why Qantas joined with emirates is that they could offer a greater number of destinations in Europe, middle-east and Africa which couldn’t be offered going via SE Asia or if they could, you had to fly to London and then backtrack on a BA flight, or you could go to Rome via Hong Kong and codeshare on Cathay. Having said that, I hate going through Dubai. Next time I fly to Europe I will take the extra time and go via the US. @Aubrey, the reason Qantas abandoned international flights out of Perth was that it was unprofitable and couldn’t offer the destination choices the Asian airlines could via their hubs. A high cost base meant that they were completely uncompetitive. You seem to forget Qantas is a business and like all businesses, they need to make a profit to invest in new aircraft and product.. Remember the days when BA flew to Perth via Singapore with a B747? They withdrew because they couldn’t compete at a profit. The Perth London flights will be aimed at Perth based travellers and those travelling to London from Adelaide. or those from Europe who want to start their holiday in Perth/Adelaide. Given that the airport earns a lot of money from airside operations and through rent from the different retail operations, I am sure they will work something out. Problem with Darwin is the RAAF owns the runway. Broome in its Master plan has land set aside for a new airport and protected the anticipated flight paths. All we need now is get Wagners on the job. The geographical advantage that Asian and Middle-Eastern ports give to their airlines will only be diminished once ultra long haul aircraft give QF non-stop capacity into Europe. Unfortunately their geographic location as an interline port is only part of the equation – the other element is base-line cost structure. This is where legacy carriers and carriers from Western countries just about find it impossible to compete – we value generous wages (not even high these days) but still get undercut by countries where wages and the cost of living are comparatively low. Having said that, QF needs to find a way to exploit the non-stop in terms of competitive price structure, reduced flight times, and nationalist parochialism otherwise they will balk at pursuing hub-busting non-stop services – or just chase the traditional Kangaroo route whilst ignoring a wealth of other options. QF might need to make the market here and spend money on clever marketing to make money. available for the taking in non-stop QF equipped services to more European locations that just London. With large migrant populations from Greece and Italy, future QF non-stop services should be looking to get QF metal back onto these routes. Qantas used to fly Qf9 Melbourne – Bombay – London and KLM went Melbourne – Colombo- Amsterdam. How about using India , Sri Lanka or Maldives as a hub? Anybody thought about Cocos or Christmas Island. Both are Australian territories and could be developed into tourist paradises. Singapore was a very efficient hub so why not return to gunning there. @ Adrian. The RAAF owns the runways at Newcastle, Townsville and Darwin. Townsville and Darwin are what are termed joint user airfields. When I was at Townsville, the mirages, F18s and F111s worked around the commercial domestic and international operations. So what is your point? I don’t know what the arrangement is at Willy but given I hav never been delayed suggests that the commercial operations are managed as normal traffic except when they air force is conducting arrestor hook training at 2OCU or a real world cable engagement occurs, then there are delays. I think you are all mistaken to think that there will be all these great long haul routes to Europe and more with the new generation of aircraft. There simply isn’t the passenger numbers to support such ideas from Australia. People talk about the ethnic diversity from southern Europe, but history has shown their isnt the demand to support daily flights to places like Athens. I am sure Qantas looks at the passenger destination figures from the Department of Transport as part of their route structure reviews and the available capacity. I am sure Virgin does the same. @Anil, I address your Asia/sub continent points in a response above. I don’t see how hubbing through India is an advantage. There simply not he passenger numbers to support a large number of destinations in Europe for Qantas to fly to. As for KLM, they have not flown to Australia for a long time. Also Anil, you have raised the east coast emphasis of Qantas and where it flies. The reason is that’s where the majority of the population are. 70% of the population live in an arc from Wyalla to Nambour. Over 50% of the population live in Sydney, Brisbane and Melbourne. Done Dubai twice. Never again. Singapore reigns. I am talking about a developing a full on hub over 10-20 years with a small city/large town to for the people to service it. Hong Kong didn’t just build an airport they built a neighbour hood around it.